The weather on Phi Phi Island is fantastic and that is exactly what you would expect when you plan a holiday on an island paradise. People from around the world come to Phi Phi Island to enjoy the weather, enjoy the beaches, diving, water sports, great food, drink and so much more. When planning your holiday you will want to consider the general weather. The more ideal the weather the higher the prices may go but for the discriminating traveler that is precisely when you want to go. 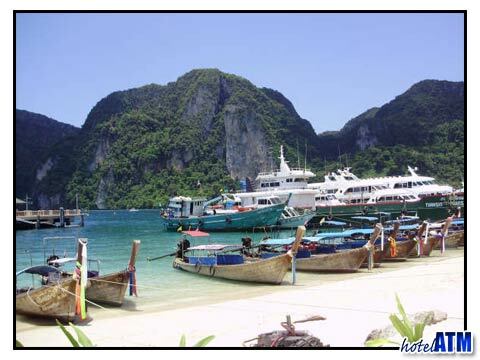 You can consider a Phi Phi Island holiday during other times of the year and enjoy a fantastic holiday on a budget. Hot Weather Season - ranges from March until May. Bring the sun block and drink plenty of water. You should avoid sunbathing during the midday. You would not want to be roasted and unable to enjoy Phi Phi Island by having to stay all day long in your Phi Phi Hotel. For those who enjoy the heat you will love this time of the year on Phi Phi Island and you can often find some good deals on Phi Phi Island hotels and resorts. Wet Weather Season - Phi Phi Island has a wet season from June through September but don't be frightened away from this season because you will find more sun than rain. The wet weather season seems to scare some visitors but those who do go to Phi Phi Island often say that it was glorious and they did not experience nearly the wet weather that they expected. If you can plan your Phi Phi Island holiday during this period you should not hesitate. Cool Weather Season - Starts in October and ends in February with temperatures varying from a low of twenty-seven Celsius and a high of thirty-five Celsius. These are the most comfortable temperatures on Phi Phi Island for most visitors and you will find this island paradise is full of people looking to enjoy great beaches, lovely sunsets and amazing day and night activities. No matter what time of the year you visit Phi Phi Island you will find that the weather is generally very good. You can pick the time of the year you travel to Phi Phi Island based on the climate or simply by when you can take time off of work for a holiday. Whenever you go you will enjoy a wonderful holiday on this island paradise known as Phi Phi Island.